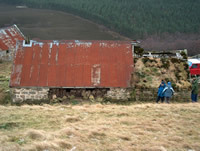 In 2005 The Cairngorms National Park Authority commissioned a conservation engineer to look at the two buildings at Auchtavan that had been listed by Historic Scotland. The 19th century cruck framed cottage with the hingin lum and its associated horse mill. 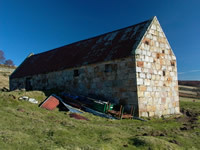 On his recommendation Braemar Community Ltd were approached to be the lead body to take control of the restoration work needed. 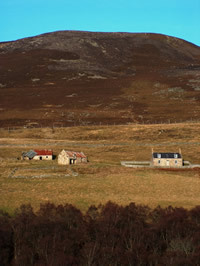 Before any work could be undertaken it was necessary for BCL to agree a lease of the buildings and land from Invercauld Estate. Once the lease was in place a very detailed inspection of the two buildings was undertaken. The listed cottage proved to be in an extremely parlous state with part of the roof blown off and associated damaged to the cruck frames causing the walls at the rear and west end of the house to be progressively collapsing. Over a number of visits, it was apparent that the cracks in the walls were widening and that it was merely a matter of time before the building was a total loss. 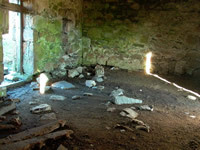 Where the roof had blown off the original thatch was exposed to the elements and great gaps were opening and exposing the underlying timbers and where these met the walls the masonry was disintegrating. At this time detailed drawings were made of the building to record the extent of the damage and to fully assess the justification of its listing. 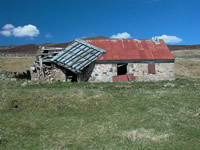 This determined that the cottage was quite unique and that a full rescue operation was not only necessary, but urgently required. The horse mill which was examined at the same time. 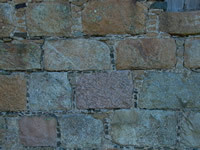 It was obvious that this building too was at serious risk with large cracks appearing in both the east and west faces of the building at its north end. Close inspection of the building gave much cause for concern that there was a danger of the north gable wall falling outwards if action was not taken to arrest the damage. 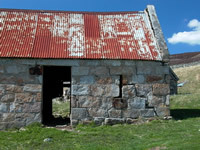 The architectural features of the mill are a good indication that arable farming at this altitude (1400 feet) was extremely worthwhile and is a fine example of its type. 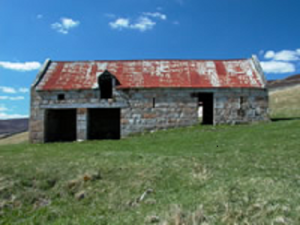 It is quite evident that this mill has been expertly built as can be seen from the condition of the outer walls. Measurement by the architect revealed that even today the building is just one inch off being perfectly symmetrical. Internally the same high quality of workmanship is still evident despite the ravages of time and weather. 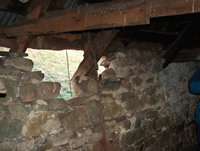 When the interior of the mill was examined it was clear that the main problem with the north gable was the fact that sheep and cattle had been having free access to the building in stormy weather and when the ground inside the mill was wet they had undermined some of the foundation stones. 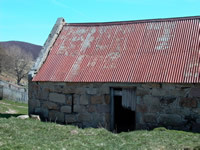 The principle feature of the group is undoubtedly the hingin lum and where it was exposed to the elements at the east gable of the cottage it was clearly in a sad way. Close inspection of the lum where it comes through the roof showed that it was actually beyond saving and that it would have to be carefully removed and replaced. Inside the cottage the hingin lum was in remarkably good condition and in need of only minor repairs and maintenance to ensure its survival. This was particularly gratifying because it is such a rarity. 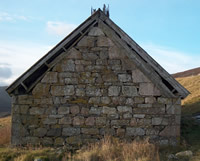 The other great feature of the cottage is the construction of the roof with its wooden pegs holding the trusses together and the supporting crucks. 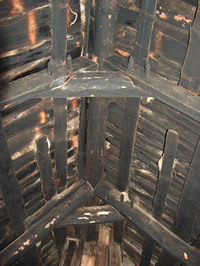 The smoke blackened timbers tell their own story of life in the 19th century. 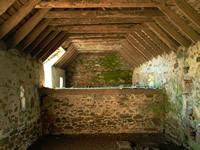 The missing section of roof at the west end of the cottage revealed the sleeping area which were above the animal quarters below. This area had suffered greatly from the wind damage and was very insecure. 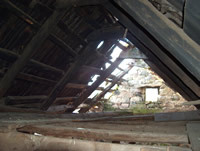 Where the wind had caused havoc with the roof it had also affected the roof trusses and where they were supported by the cruck frames the violent movement had precipitated the collapse of the walls. 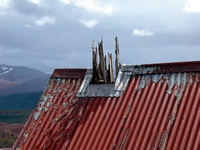 Just after the initial inspection had been completed in October 2006 the area was again subjected to a severe gale and this time it completely tore away the section of roof that had been left hanging. 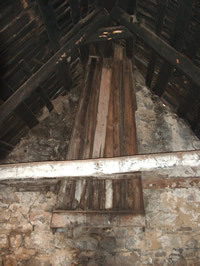 The departure of the roof had a catastrophic effect on the roof supports and exposed the damaged ends of the trusses where they met the crucks. 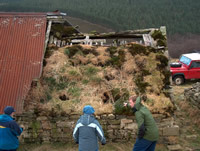 The damage caused by the wind left the west end of the south facing wall in a state of virtual total collapse and was now threatening the west gable. 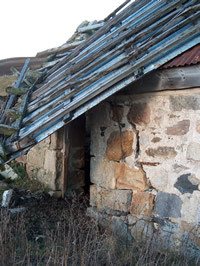 The exposed gable and roof were now precariously balanced and a clear danger to any unsuspecting visitor. It was now a race against time and the elements to get all the necessary arrangements and permissions into place if the building was not going to be a total loss. It was now a case of monitoring the site on a daily basis to record any further deterioration and to make sure that no one took the risk of exploring the interior of the building. The west doorway was now beginning to disintegrate with the cracks visibly getting wider. It was now imperative that the building had to be protected from the impending winter if there was going to be anything left to save.